Nancy Holmes, the first female graduate from the UIC College of Engineering. Today, about 25 percent of workers in STEM careers — those involving science, technology, engineering and math — are women. But back in 1968, when Nancy Holmes was the first woman to earn a degree in engineering from the UIC College of Engineering, the percentage of women in science or engineering careers was diminishingly small. For Holmes, who grew up in Oak Park, the probability that she would go into the sciences was high from the start — several uncles and her grandfather were civil engineers, her brother is an architectural engineer, her father was an engineer at Zenith Radio and two aunts had advanced math degrees. Her mother had a job in hospital nutrition and was well-versed in chemistry. So, when her high school dean asked what she wanted to major in for college, she said engineering without hesitation. She began her freshman year in the fall of 1958 at the Urbana-Champaign campus. For the most part, Holmes said, the men in her classes and her teachers treated her with respect. She married her husband, Tom, in 1959. Soon, they added two daughters to the family, and Holmes spent the next nine years working on her degree while raising her children and participating in suburban life. From 1959 through 1961, she took classes at the University of Illinois Navy Pier campus. In 1961, she spent six weeks in a former Civilian Conservation Corps camp near Blackduck, Minnesota, for her required course in surveying. She was the only woman in her barracks. She remembers that her male classmates treated her very politely, if formally at first, but later they got along as friendly colleagues. In 1965, Holmes went back to the UIC campus, which was known then as the Circle Campus, and had just opened. She earned her bachelor’s degree in structural engineering and materials science in 1968, her master’s degree in materials engineering in 1970, and her Ph.D. in engineering in 1976. She was the first woman to earn each of these degrees from the UIC College of Engineering. She will return to campus Dec. 15 to celebrate with fellow Golden Grads — members of the Class of 1968 — at commencement. Holmes, 77, worked at Sargent & Lundy, a Chicago engineering firm serving the power industry, from 1976 to 2018. She helped develop computer programs used to determine the magnitude and effects of loads on structures in nuclear and fossil fuel plants caused by earthquakes. She also supervised work on computer programs for soil structure interactions, the generation of response spectra, and analysis of HVAC hangers and piping systems. Holmes insists that engineering is a great profession for women. Holmes has been an active member of Engineers Without Borders for many years, and has traveled to Guatemala and Honduras to help develop bridges and sanitation systems. 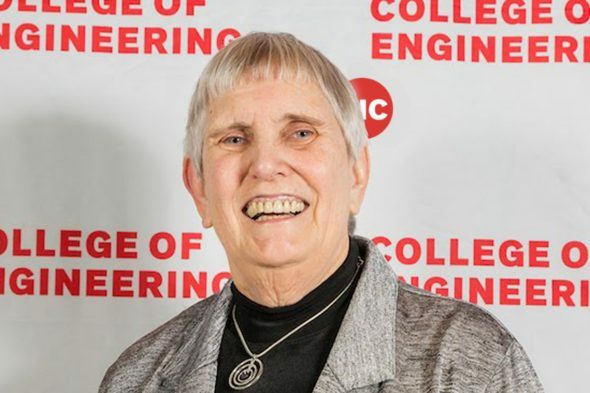 She established the Nancy Anderson Holmes scholarship in 2006 in memory of her aunt, which benefits UIC civil engineering students. She received the Legacy Alumni Achievement Award from the UIC College of Engineering in November. Holmes lives in Oak Park with her husband, Tom. They have three children, 10 grandchildren and two great-grandchildren.